This CTEK Battery Charger is fully automatic charger and maintainer. It's 6 step process maximizes battery life and performance. Perfect for charging smaller 12 V batteries that can be found in motorcycles, jet skis, ATVs and lawnmowers. It can also be used for maintenance charging in car or truck size batteries. All CTEK products offer an industry best 5 Year Warranty. Pete says CTEK chargers offer great value for your money. Especially when combined with BatteryPete's free freight policies. This CTEK Battery Charger 12 Volt .8 Amp is a fully automatic charger and maintainer. The patented 6 step process maximizes battery life and performance. Perfect for charging smaller 12 V batteries that can be found in motorcycles, jet skis, ATVs and lawnmowers. It can also be used for maintenance charging in car or truck size batteries. The CTEK Battery Charger 12 Volt .8 Amp offers a easy to read display that allows the user to follow the entire charging process at a glance. Specifically designed to charge a 12 volt battery from 2.5Ah to 32Ah and is suitable for maintenance charging up to 100 Ah. This CTEK Battery Charger is also splash and dust proof and delivers 0.8 A of power once placed on the battery. 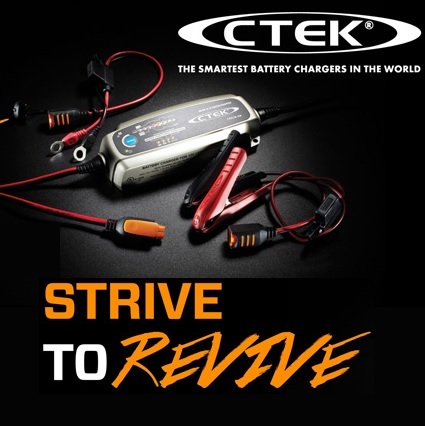 Not only are CTEK Battery Chargers designed to protect your vehicles electronics. It is also non-sparking, reverse polarity protected and short circuit proof.All CTEK products offer an industry best 5 Year Warranty. Be the first to review “CTEK Battery Charger 12 Volt .8 Amp” Click here to cancel reply.